This is a French Art Deco period advertising poster for Terrot Cycles. This exquisitely made poster features a brightly colored background of red, yellow and white in an upside down triangle. 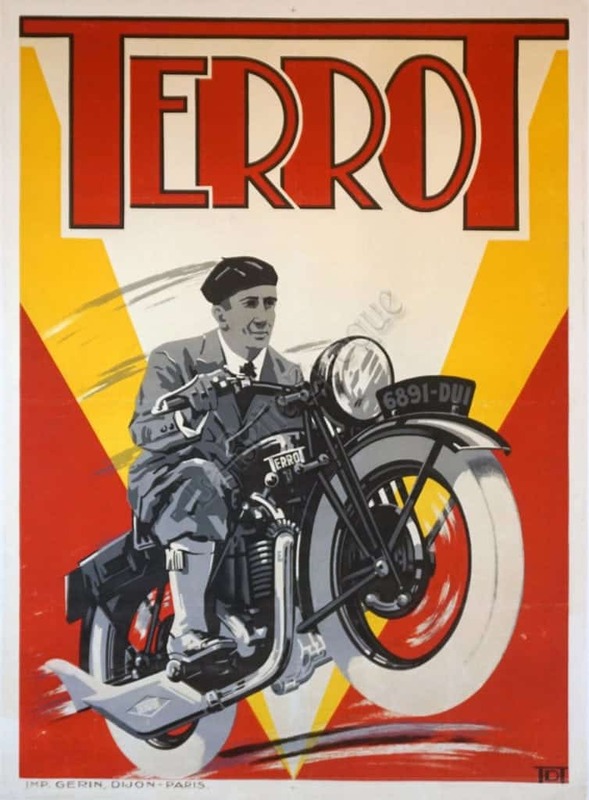 In the foreground of the poster is detailed and realistic monochromatic representation of a dapperly dressed man riding a Terrot motorcycle. Above him in the center are big bold block letters “Terrot.” This is a magnificent, quintessentially Art Deco period poster created by the artist who was solely identified by the initials “TDT.” This authentic stone lithograph was printed by Gerin, Dijon-Paris, 1932.